A visit to Phra Kaew Temple Yes. Of course,Wat Phra Kaew is one of the most famous (and most holy) temple complexes in Chiang Rai. Today is a good day to make merit so lets go to the temple. Wat Phra Kaew which is an ancient sacred temple visited by Chiangrian people and Buddhists generally. 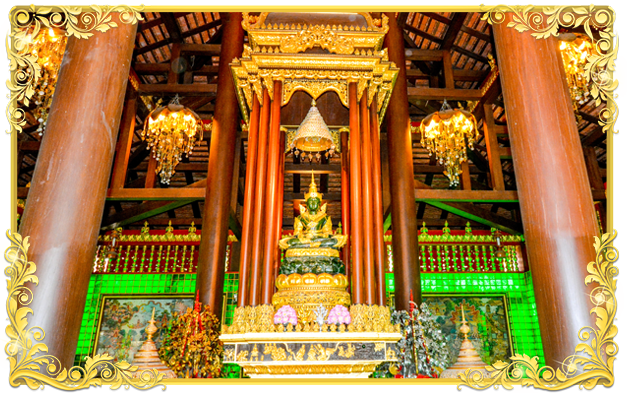 The temple is famous for the beautiful sitting Buddha image that is known as the Chiang Rai image of Phra Buddha Ratnakorn Navuti Wassanusornmongkhol.May the sanctity of Phra Chao Laan Tong Buddha Image bless you with good luck and fulfill your wishes at all times !! It is believed that if we pay respect to the Buddha and make merit here, good things will come to our lives. May Phra Yoke Chiang Rai and Phra Chao Laan Tong bless you healthy and prosperity. However, I hope you have enjoyed and are delighted about this temple. I wish you all the best in making merit for yourself and family.